Our Peppermint Essential Oil has a powerful scent and is Steam Distilled. Herbal Folk Traditional uses for Peppermint Essential Oil include common cold, cramps, diarrhea, dysmenorrhea, flatulence, headache, indigestion, intestinal colic, nausea, pregnancy vomiting, sore throat and toothache. Peppermint Essential Oil is my oil of choice when I have tightness in my neck, shoulders and upper back. I have also used it when I used to have a tight lower back. I started using Peppermint Essential Oil mainly for these complaints and used it more often in the beginning in 1997. Back then I considered Peppermint Essential Oil my Chiropractor in a bottle! The more I have tweaked my diet and herb regimen along with proper sleep and an overall thriving lifestyle, my need to use Peppermint Essential Oil today is far and few between for these complaints. However I consider Peppermint Essential Oil a staple that is always in my essential oil collection to share with friends and family when they are over if they should have a need for some. It has a strong refreshing scent of Peppermint. Peppermint Essential Oil blends well with woodsy earthy scents. I have used Peppermint as a cooling herb to stimulate the circulation of qi while supporting the Liver and Lung meridians. My experience with the use of Peppermint Essential Oil shows me that it helps to disperse toxins while moving the blood and lymph fluids. 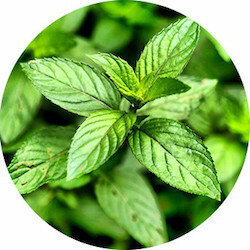 Peppermint is extremely useful to me as a cooling agent and also acts as a counter-irritant to relieve itching from bug bites. I have used it to relieve muscle spasms caused by internal heat and also as a digestive aid. I've made tooth polish with Peppermint Essential Oil as one of the main ingredients. It's very concentrated and a few drops goes a long way! Due to its cold nature, I do not recommend using Peppermint Essential Oil on infants or children unless your naturopathic doctor guides you or you have prior experience with its uses and take full responsibility. Peppermint Essential Oil combines well with Cedarwood, Cypress, Eucalyptus, Geranium, Lavender, Lemon, Mandarin, Marjoram, Niaouli, Pine, Rosemary and Spearmint. Peppermint Essential Oil is tridoshic and seems to be especially calming to pitta constitutions due to its cooling nature. Cautions & Contraindications: Peppermint Essential Oil is contraindicated in cases of painful menstruation from uterine fibroids, cysts or endometriosis. Peppermint Essential Oil has the following actions: analgesic, anti-inflammatory, antimicrobial, antiphlogistic, antipruritic, antiseptic, antispasmodic, antiviral, astringent, carminative, cephalic, cholagogue, cordial, emmenagogue, expectorant, febrifuge, hepatic, nervine, stomachic, sudorific, vasoconstrictor and vermifuge.